On Sunday, September 21, 2014 the New York Yankees will give out 10,000 Ty Beanie Buddy’s to kids 14 years old and younger. 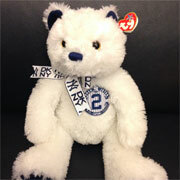 The Beanie Buddy will feature a #2 for Yankees star Derek Jeter. During the 2013 season, the Yankees had a similar promotion for Mariano Rivera, those Buddies can sell in the $50 range on eBay. This will be a key collectible from Derek Jeter’s final season with the Yankees. Jeter is an all-time great Yankee, which is saying a lot considering the players who have played for that franchise. Beanie Buddy’s are much larger than regular Beanie Babies, and were first released in September 1998. Here are some Beanie Buddies Worth Money.